As well as keeping kids entertained, a climbing frame will help them explore their limits and build their strength. If you’re lucky, it will also encourage them to use up their energy outside and distract them from climbing all over your living room sofa. 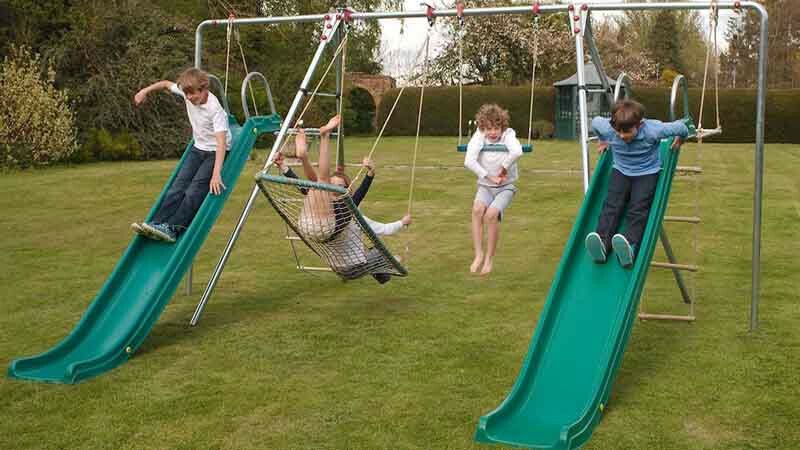 Before you buy consider how many children will want to play on it and how old are they? Some climbing frames are designed for just a couple of toddlers at a time and will be easily outgrown, while others will be sturdy enough to hold a small tribe and see them through to their teenage years. The best designs offer more than just an opportunity to climb. You can find all-singing, all-dancing frames that act as complete ‘activity centres’ and include elements such as rope ladders, look-out towers, monkey bars, double swings, tube slides and climbing walls, all designed to challenge the most curious of tots. You can adapt parts too - a height-adjustable baby swing seat can be made into a standard seat as your toddler gets older, for example. In terms of aesthetics, think about the size of your garden and what you want your frame to be made from – plastic, wood or metal, or a mix of all three? You’ll pay a little more for a stylish bespoke wooden design, but many come with warranties and are built to last for years. Here we’ve rounded up some of the most enticing climbing frames around to satisfy the most adventurous little monkeys. Fat Moose climbing frames come in an infinite number of variations, with adaptable ladders, slides, swings and climbing walls to fit your garden area and suit your child. The CleverClimber Club is a great entry-level frame for little gymnasts and is made from easy-care solid timber. 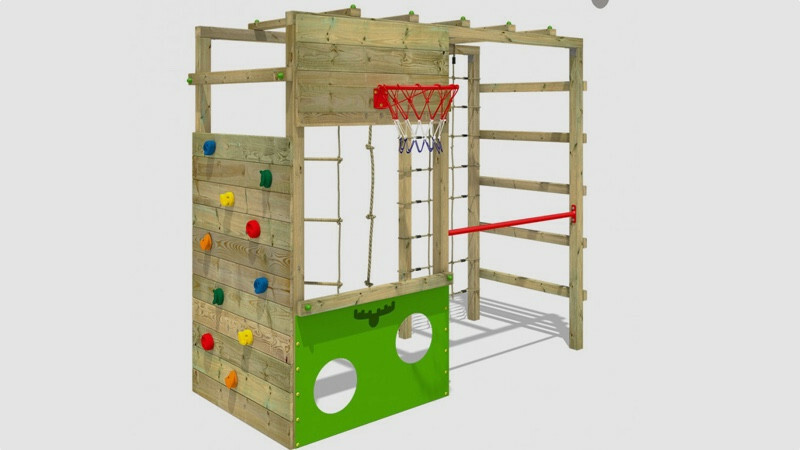 Little ones can use it to climb up the wooden ladder, dangle on the net or conquer the climbing wall. There’s also a rope ladder and a LineUp climbing rope to work their balance and strength and a long tumble bar to practice on, the latter of which can be adjusted to a height to suit your child. We love the fact that this is so versatile and can be added to – little extras for example include are a DingDong bell, from £30, and a HangRing basketball ring, from £38. The Nova climbing frame price tag isn’t cheap, but it will keep both toddler and teenager entertained and is built to last. On board you’ll find a double belt swing – one of which can be made into a baby seat and adapted as your child grows. There’s also a trapeze bar to entice older children. You’ll find not one, but two slides – one straight and one tube – both designed with a step at the end so that your child lands on their feet, as opposed to their bottom. There’s also a slatted 70-degree angled ladder with five climbing rocks, a set of monkey bars around the back, an upper cabin and finally a lower playhouse with toy kitchen, café counter, chalkboard and freestanding bench. It is made from a specialist cedar wood that is practical and durable and naturally resistant to rot and insect infestation. It's also soft to touch for little hands, and resistant to flaking and splinters. An occasional restain will keep it looking as good as new, and if it doesn’t you can also make use of the 10-year warranty. It comes flat-packed though, so you’ll need to be a good DIYer to put it together. Plum is known for its well-structured range of climbing frames and its worth taking a look at the company’s website to browse their vast range of designs. 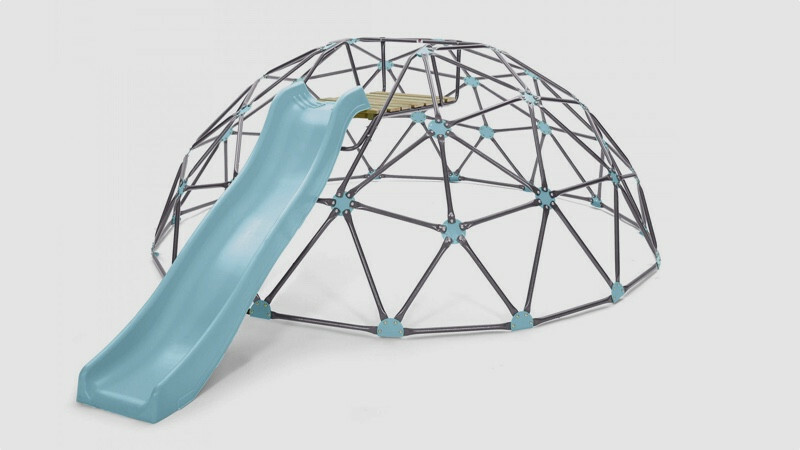 This climbing dome with 6ft slide (4ft version also available) stands out for us because of its stylish and simple design. Recommended from the age of three, its geometric frame is designed to nurture cognitive and motor skills as kids can climb, swing and hang off it and have fun trying to work out how to get to the top. 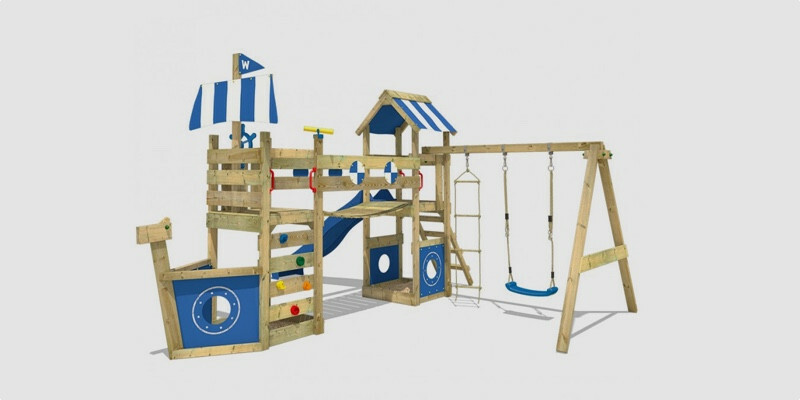 Although you can buy standard climbing domes with no frills, we think the wooden platform with blue slide is a fun addition to this design - kids will love the challenge of trying to make it to the top without touching the ground, and can then enjoy whizzing down the slide once their task is complete. There are two designs to choose from, so depending on your garden size you can opt for the larger dome with 4ft slide or the giant dome with 6ft slide. 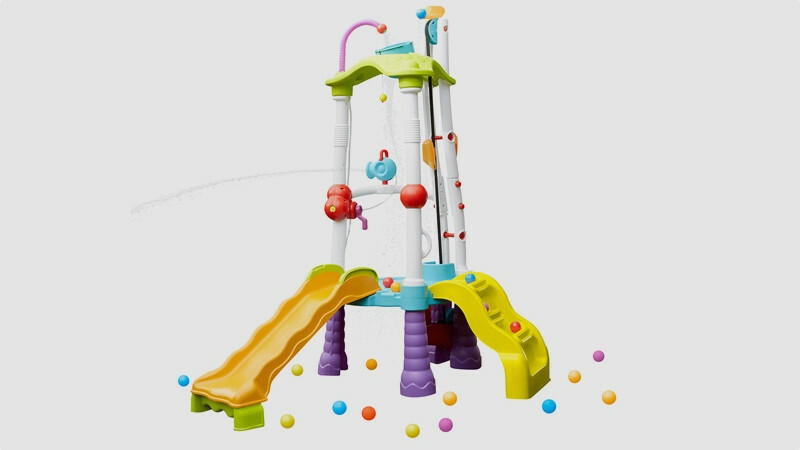 Aimed at two to five year olds, this Fun Zone Tumblin’ Tower is more than just a climber for kids. It also offers a splash element to keep them refreshed in the summer months. Unlike the more complex climbing frames in our round up, at 190cm high the Tumblin Tower at is simple to navigate with no tricky bars or walls to navigate. Little kids can climb the short four-stair ladder and come down the short slide with ease. There’s also direct water flow to the slide, a water cannon they can point and shoot and a ball conveyor they can operate to control the 25 colourful balls that come with it. And when it gets too cold outside, the water element can be left switched off and the design housed inside. The attractive ship design of the Stormflyer really stands out from the crowd as there’s enough on board to keep a little pirate entertained for hours and nurture their imagination. 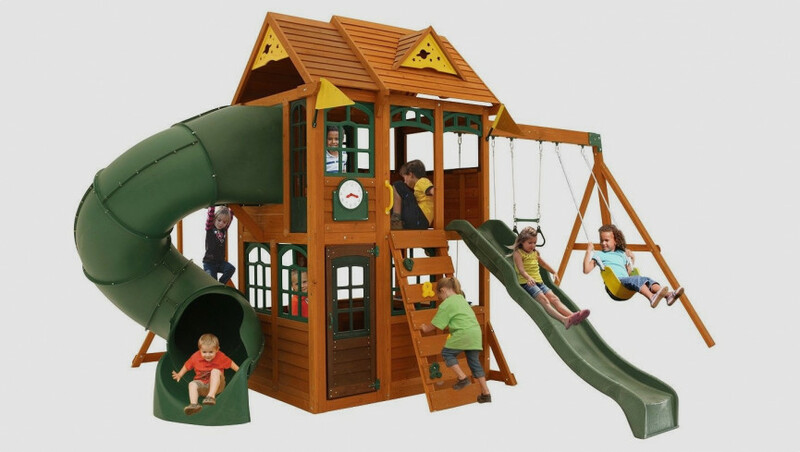 Made from solid pressure-treated wood and a weatherproof tarpaulin, there are two integrated sandpits inside, a wavy slide that has a built-in water connection and a rope ladder that features wooden rungs. Kids can also walk along the wobbly bridge or make their way up the climbing wall. There’s also a belt swing and lookout telescope included. You can choose from a range of colours to match your garden shed too, including light blue, green, red and yellow, and although its not recommended for children under three years, the platform height is a not-too-lofty 120cm. For a bespoke metal frame try Brave swing sets. The company sells a range of tailor-made climbable frames with accessories that are perfect those who want a taste of the circus. The great thing about these designs are that they’re ideal for little kids and teenagers alike, so it’s money well spent that will stand the test of time. The Brave website features a ‘3D swing set configurator’ that lets you design your swing and preview it online before you buy, so you can work out what will best suit your family and garden. The frames are made from galvanised steel and every inch is designed to be used – whether you’re swinging, climbing or jumping. The Double Racer is a great example of a design that is great for a large family. It features two Cliffhanger slides, a Frammock, two knobbly leg climbers and a trapeze bar.